Heritage Open Weekend, which runs from Thursday 10 to Sunday 13 September, gives people the chance to explore our familiar buildings which are normally not open to the public. 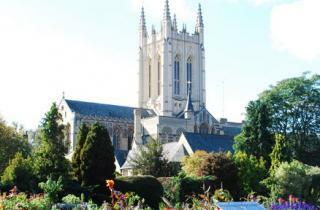 This year St Edmundsbury Cathedral, Bury St Edmunds, is offering the chance to find out about its bells and the books in the Ancient Library. On Friday 11 September the Cathedral’s Ancient Library is open from 2 pm. Situated above the main entrance of the Cathedral, this is the oldest parish library in the country and contains a wealth of interesting and intriguing books which have been donated to the library over the centuries. Help will be on hand to tell you more about the books on display. On Saturday 12 September the Norman Tower, the bell ringing tower, will be open for timed, ticketed tours at 10.00 am, 10.45 am, 11.30 am, 12.15 pm and 1 pm. Bellringers will explain the art of bell ringing and the story of the bells themselves. It does not include a visit to the rooftop. Minimum age 8 and all children must be accompanied by an adult. Visitors must be fit enough to climb a narrow spiral staircase. In addition on the first day of Heritage Open Weekend Thursday 10 September, a tour is being offered by Cathedral staff called History and Holiness. This starts at 2pm at St Saviour’s ruins (Fornham Road), one of the medieval hospitals of the Abbey of St Edmund, and takes visitors through the town to the Abbey ruins. At stopping points on the route, the guides will talk about the history of the site and link it to the Rule of St Benedict, with reflections on how that might affect our lives in the 21st century. All Heritage Open Weekend events are free of charge though tickets are required, which can be obtained from the Tourist Information Centre at the Apex or by calling 01284 764667 or online here.